Analytics being hot field right now in India, there is obviously a fair amount of job switching among the talent pool. Companies that were the early adopters of analytics as a service offering, end up being the analytics talent providers to the industry as a whole. These 10 firms provided 19% of analytics talent pool in India today. In other words, 19% of analytics professionals in India today have worked for these 10 firms in the past. The most interesting fact here is that the analytics professional that moved out of these firms are almost twice the number of analytics professionals they house today. On a rough calculation, these numbers point out at an industry attrition rate of around 15%, assuming mature analytics offerings since past 10 years. We also tried to capture background of analytics professionals in India. Almost 45% of Analytics hiring in India is fresher’s hiring, i.e. recruit professionals straight out of college and train them on analytics and related services. 23%, and this is the interesting part, analytics professionals in India moved to analytics from other services. These are the internal transfers in the bigger firms, i.e. professionals that earlier were working in other related areas and moved sideways to analytics. 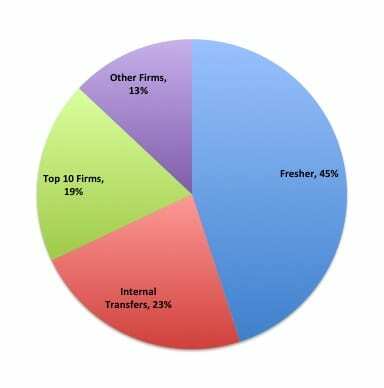 19% of analytics professionals moved to their current firm from the 10 firms listed above. The rest 13% are from other firms apart from the one’s listed above.